We’d love your help. Let us know what’s wrong with this preview of Reproductive Politics by Rickie Solinger. The term "reproductive politics" was coined by feminists in the 1970s to describe contemporary Roe v. Wade-era power struggles over contraception and abortion, adoption and surrogacy, and other satellite issues. Forty years later, questions about reproductive rights are just as complex--and controversial--as they were then. Focusing mainly on the United States, Reproductiv The term "reproductive politics" was coined by feminists in the 1970s to describe contemporary Roe v. Wade-era power struggles over contraception and abortion, adoption and surrogacy, and other satellite issues. Forty years later, questions about reproductive rights are just as complex--and controversial--as they were then. Focusing mainly on the United States, Reproductive Politics: What Everyone Needs to Know(R) explores the legal, political, religious, social, ethical, and medical dimensions of this hotly contested arena. To ask other readers questions about Reproductive Politics, please sign up. This author manages to write an entire book on abortion without once mentioning fetal development or even the status of the unborn baby. You would think that abortion had nothing to do with babies at all, or that it kills anything. It's remarkable how much she was able to avoid the issue, as many pro-choicers do. Also, many of her facts were inaccurate. There are numerous studies attesting to the breast cancer/abortion risk, even very current ones – same thing with the connection of abortion with This author manages to write an entire book on abortion without once mentioning fetal development or even the status of the unborn baby. You would think that abortion had nothing to do with babies at all, or that it kills anything. It's remarkable how much she was able to avoid the issue, as many pro-choicers do. I never really studied any formal gender studies classes at high school so, as a result, never had the opportunity to cover some of these topics formally. Nonetheless, they are highly relevant and important, so I was really pleased to have the opportunity to read this book. 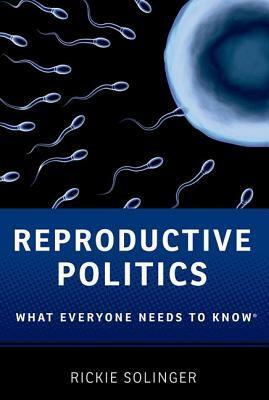 In Reproductive Politics I felt I’d found a well-researched, well-presented title, covering a range of current topics, many of which are highly controversial. They are also issues that we are often reluctant to talk about, per I never really studied any formal gender studies classes at high school so, as a result, never had the opportunity to cover some of these topics formally. Nonetheless, they are highly relevant and important, so I was really pleased to have the opportunity to read this book. In Reproductive Politics I felt I’d found a well-researched, well-presented title, covering a range of current topics, many of which are highly controversial. They are also issues that we are often reluctant to talk about, perhaps because they can provoke highly emotional or passionate responses. ‘Politics’ seems a perfect word for the social, legal and moral complexities surrounding issues such as abortion and birth control. And nothing’s going to change if we can’t find a way to talk about these issues more openly. I'm preparing to teach a course at the University of Connecticut MPH Program this fall and had read good reviews of this book. I'm very glad that I purchased it and will be recommending it to my students this fall. It's a historical look at the politics of reproduction and includes great perspective on many of the ethical dilemmas and questions that seem to arise and change daily. Although it does have a lengthy bibliography, this is not a scientific textbook. It's an overview and an analysis of I'm preparing to teach a course at the University of Connecticut MPH Program this fall and had read good reviews of this book. I'm very glad that I purchased it and will be recommending it to my students this fall. It's a historical look at the politics of reproduction and includes great perspective on many of the ethical dilemmas and questions that seem to arise and change daily. Although it does have a lengthy bibliography, this is not a scientific textbook. It's an overview and an analysis of how our society has been handling these challenges. Ms. Solinger gets it. I will be happy to have my students read her chapter on Family Building, Reproductive Technology and Stem Cell Research which does a wonderful job in a short series of questions and answers of laying out the complexities of what we've done scientifically without legally or ethically delineating how and when to use this technology. 1) Obviously reproductive rights for poor women (and, then, often women of color) are much less secure than reproductive rights for women of greater means. To my mind, debates about reproductive healthcare and rights do not adequately address this disparity -- which is particularly troubling given many religious groups' obstinance in providing affordable, robust, and high-quality reproductive healthcare. 2) The text lays out, though not in depth, the history of framing reproductive rights with an emphasis on the right to an abortion as a battle between "life" and "choice". Perhaps Solinger's most interesting point in this work is that framing access to reproductive healthcare (abortion included) as a choice allows the system to mark some women as "good choice makers" and others as "bad choice makers"; rather than looking at issues of reproduction as a choice, conceptualizing a woman's control over her own fertility and reproduction as a right is fundamental and necessary to providing women with complete autonomy. A really good primer on the wide range of lenses one can study reproductive policy and debate, while remaining largely non-partisan. At times, the text felt a little redundant reading from start to finish, but I suspect this was so people could jump into any chapter and be given a clear foundation. Not an actual criticism of the book, but it would be wonderful to see an updated edition from OUP as many of the policies mentioned have undergone changes since this published and the market is hot for A really good primer on the wide range of lenses one can study reproductive policy and debate, while remaining largely non-partisan. This is a highly informative work, exposing the politics of reproductive health policies in the US, and the resultant social impacts. An interesting and useful treatis on this fundamentally important topic. How can we hope to reach our developmental and societal zenith when we continue to objectify and legislate the sexual and reproductive boundaries of over 50% of our population, in ways that minimise and deprecate their existence as equal partners? Useful overview of reproductive politics, well-researched, neutral but feminist-informed tone. A great book to have on hand as a reference for anyone working in reproductive health policy, or anyone with questions about the sexual health debate.